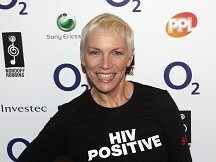 Pop star Annie Lennox will receive a lifetime achievement gong at the Inspiration Awards for Women. The Sweet Dreams singer will be recognised for her stellar music career with the Eurythmics and as a solo artist, and for her years of campaigning for humanitarian causes. Lennox, who was appointed an OBE last year for fighting Aids and poverty in Africa, will follow in the footsteps of past winners Barbara Windsor and Vivienne Westwood. Singer Adele meanwhile will be handed a next generation inspiration award at the event at Cadogan Hall in Chelsea, London, for the UK's "most inspirational, aspirational and stylish women". Other female stars and public figures nominated for awards include Samantha Cameron, Victoria Beckham, Tracey Emin, Jennifer Saunders, Kate Winslet and Stella McCartney. Lady Gaga and Alicia Keys are among the celebrities nominated in the international category. The awards, which raise money for the Breakthrough Breast Cancer charity, will be presented by former tennis star Andrew Castle and Sky News presenter Sarah-Jane Mee.